Today we are sharing some of our favorite holiday recipes that we like to make/plan to make this year! Recipes are not ours unless otherwise noted (except for Daisy's & Jana's) and so if you Pin these or share them please go to the original source which we have linked in all cases. One of my favorite things to do is scour Pinterest for new recipes. 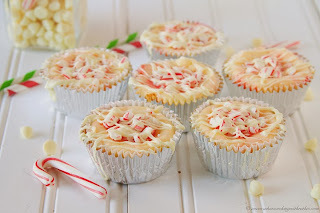 This holiday season I decided to search Pinterest for new holiday recipes and of course I had no trouble finding any! Line a muffin tin with papers (you could also use a mini muffin tin if you prefer). In a microwave safe bowl, melt the butter & peanut butter together for 45 seconds. Stir until smooth. Add graham cracker crumbs and sugar and mix to combine. Distribute mixture evenly between the prepared muffin cups. Refrigerate for 15 minutes to set peanut butter layer. After the peanut butter has chilled, combine chocolate and milk in a microwave safe bowl and heat in 25 second intervals until chocolate is just melted. Stir until smooth. Distribute chocolate evenly over the top of the peanut butter layer. Sprinkle with sea salt and chill until firm, at least 30 minutes. Store covered in the fridge. *This recipe is from the blog Blue-Eyed Bakers. Link to recipe: Crunchy Peanut Butter Cups. Image credit to Blue-Eyed Bakers. Beat in eggs, egg yolks and extracts. In another bowl, whisk flour, baking powder and salt; gradually beat into creamed mixture. Shape into a disk; wrap in plastic wrap. Refrigerate 1 hour or until firm enough to roll. On a lightly floured surface, roll dough to 1/2-in. thickness. Cut with a floured 2-in. cookie cutter. Place 1 in. apart on ungreased baking sheets. Bake 10-12 minutes or until edges begin to brown. Cool on pans 5 minutes. Remove to wire racks to cool completely. For frosting, in a large bowl, beat confectioners’ sugar, butter, shortening, extracts and enough milk to reach desired consistency. Spread over cookies. If desired, sprinkle with nonpareils. Grease a 8 X 8 or 8 X 11 baking dish. 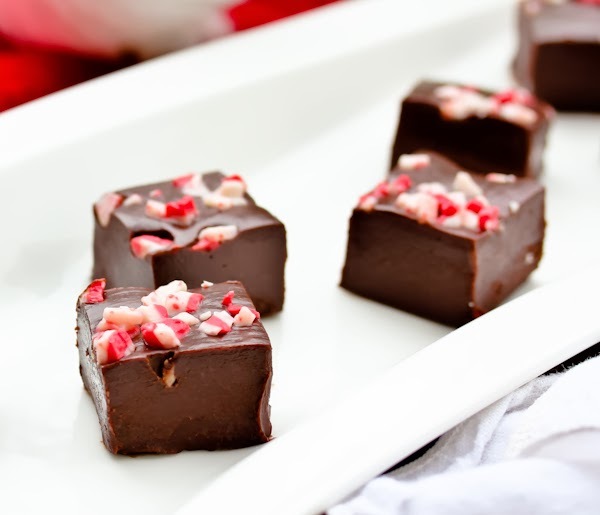 Sprinkle half the peppermint chunks in the bottom of the dish and set aside. Place a medium sauce pot over medium heat with 2 inches of water. Place a glass bowl over the top--making sure the glass doesn't touch the water. Pour the condensed milk and butter in the bowl and heat. Add the chocolate chips and salt in the bowl. Stir the chocolate and watch as it melts and thickens--about 5 minutes. The mixture should thicken to a THICK cake batter consistency--almost too thick to pour. Add both extracts and mix well. Pour the mixture into the dish. Gently tap the dish on the counter for at least a minute to allow air bubbles to rise to the surface and to smooth the surface. 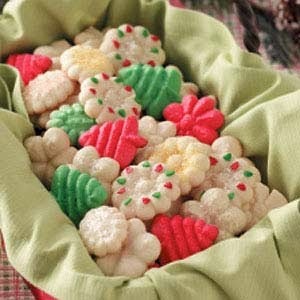 Sprinkle the remaining peppermint chips over the top and refrigerate for at least 3 hours, maybe longer, to set. To cut, dip a sharp knife in hot tap water, wipe and cut quickly. Dip and wipe the knife between cuts. Cut into 1 inch squares. * The night before the person who made this said she put the Rumchata and chocolate in the crock pot and let it sit overnight. In a separate container she mixed all the dairy ingredients together and let them sit in the fridge overnight as well. In the morning she poured the dairy mix into the crock pot and let it cook for 2 hours on HIGH. I saw another source for this recipe and they didn't do that so I think it's optional. 1. 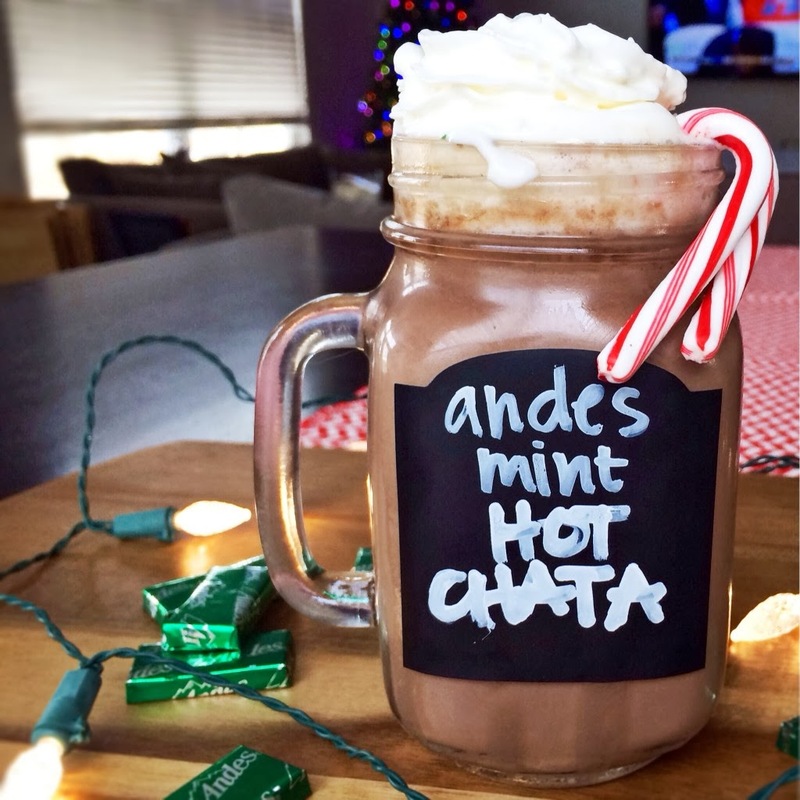 Combine 1 cup of Coffee Mate's Peppermint Mocha Creamer and 6 cups of milk in a crock-pot. 2. Stir in 1.5 cups of cocoa powder. Stir with a whisk, but it won't fully dissolve until the milk and creamer heat up. 3. Break-up and add a bar of semi-sweet chocolate and a bar of peppermint bark. 4. Cook on high for 2 hours stirring frequently. Last year Will and I made cookies for his family's Christmas Eve dinner (feast really) but I think this is what we are going with this year! They look heavenly!! Place foil liners in 2 muffin pans. Place 1 vanilla wafer in the bottom of each cup. Beat cream cheese until smooth, add sugar, eggs, and vanilla; just until incorporated. Gently stir in 3/4 C chocolate chips and 3/4 candy cane pieces. Fill each cup 3/4 of the way full. Bake 20-25 minutes or until almost set. Remove from oven; let cool 5 minutes on rack and then remove from pan. Once cool cover and refrigerate for 3 hours. Before serving; place remaining chocolate chips in a microwave safe bowl, microwave for 15 seconds, stir, 15 more seconds, stir, repeat again if necessary until smooth. 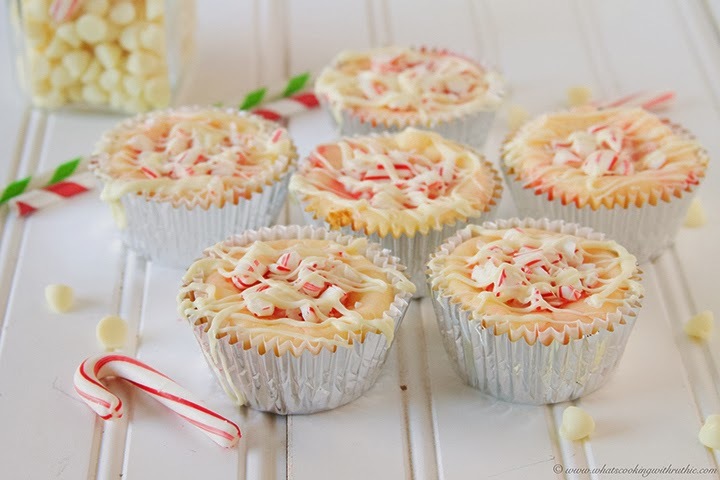 Place 1 tsp crushed candy cane in the center of each cheesecake, use a fork to drizzle white chocolate back and forth over the tops. * to crush candy canes, remove wrappers, place in gallon freezer bag, hit with the back of a metal spoon. 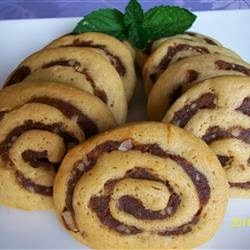 I make these cookies every year because they are AMAZING. And really, they are like potato chips. You can't eat just one or two. You can eat a TON and not get sick. In bowl, combine flour and baking powder. In large bowl, beat butter and sugar with electric mixer until light and fluffy. Add egg, milk, vanilla and almond extract; mix well. Gradually add flour mixture to butter mixture; beat until combined. Add red or green food coloring if you would like! Do not chill. 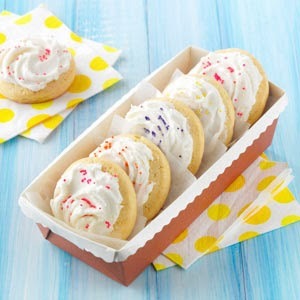 Fill cookie press with dough and with desired disks, press cookies onto ungreased cookie sheet. Cream the butter and brown sugar together in a mixing bowl until smooth. Add the eggs, one at a time, beating well after each addition. Stir in the vanilla. Sift the cinnamon, salt, baking soda, and flour together in a second mixing bowl. Slowly stir the flour mixture into the egg mixture until evenly blended. Divide the dough evenly into three portions and place each on a square of waxed paper. Wrap and refrigerate until firm, about 1 hour. Meanwhile, make the filling by combine the dates, pecans, water and white sugar in a saucepan set over low heat. Cook and stir until the filling has a paste-like consistency. Cool slightly. Working with one portion at a time, roll out the dough on a lightly floured surface to make a rectangle about 1/4 inch thick. Spread 1/3 of the filling evenly over the dough; roll up to make a log. Repeat the process with the remaining dough. Refrigerate until firm, about 1 hour. Preheat oven to 350 degrees F (180 degrees C). Lightly grease two baking sheets. Using a sharp, serrated knife, cut the rolls into 1/4 inch slices. Place the slices on prepared baking sheets. Bake in preheated oven until set and lightly browned, about 15 minutes. Cool on racks. This is a recipe from Allrecipes and can be found here. It's not the exact one my momma makes- but it is basically the same. The only thing she does different is half dates/half jumbo golden raisins. What are some of your favorite recipes to make during the holidays? What are YOU planning to make this year? PLEASE SHARE WITH US BECAUSE WE LIKE FOOD! Loving this list! It's making me drool. I went with the simple chocolate chip cookies this year to give to all my friends. Craving that peppermint fudge... Looks so good! This year my office had a cookie exchange (which happened today). It was SO much fun! I baked one of my standard autumn/winter favorites: what I call Dark Spice Cookies. 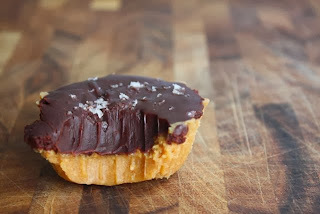 They're an autumn spice sugar cookie topped with a generous dollop of dark chocolate ganache. So yummy! Mmm, what a line up of delicious-ness. I'll take a bite of everything, plz! OOH great post! I should make the peanut butter cups for my hubby!